FTB Trading Indicator will helps you to find and Detect SOLID setups as well without being on chart. FTB Trading Indicator has some solid and objective PERSONAL rules. 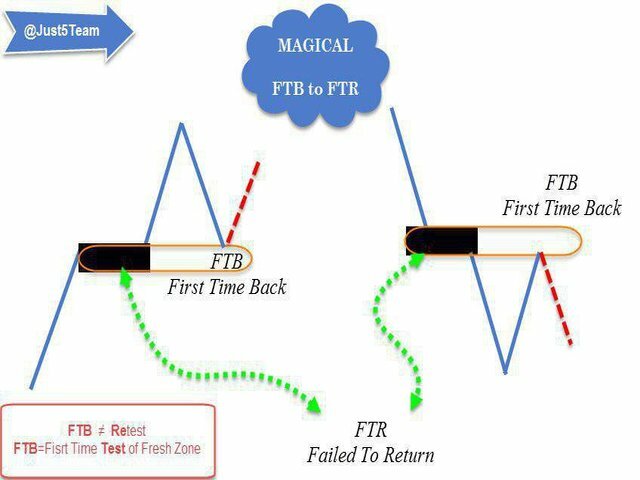 FTB trading Indicator will show your, your perfect Entry, TP and etc. Just drag one indicator per chart from the Navigator window and choose which TF you wanna it search for you. Press «FTB finder» button to automatically detect zones. BeforerMiddle=0 – how many bars before creating zone should be bullish/bearish to create zone. AfterMiddle=0 – how many bars after creating zone should be bullish/bearish to create zone. MaxBarsM1 .. MaxBarsH4=200 – number of bars considering for zone detection on each timeframe. Zones created before are being deleted. EnableM1.. EnableH4=true – enable timeframes for zone detection. TrafficBars=1 – how many traffic bars can contain V-shape to create zones. SupplyColor=Orange – color of Supply zones. DemandColor=LawnGreen – color of Demand zones. ShowAutoLines=true – show horizontal lines on the top and bottom of automatically created zones. LineColor=None – color of horizontal lines. LineWidth=2 – width of horizontal lines. ShowSolidLines=true – show solid (TP) lines on highest/lowest close price of V-shape. SolidColor=None – color of solid (TP) lines. ShowEngulfingArrows=false – show arrows at engulfing candle. CreateAlertOn=false – send alert and push notification when a FRT is created. TapAlertOn=true– send alert and Push-notification after the price taps a FTR first time. EngulfingAlertOn=true– send alert and Push-notification if engulfing candle appears after tapping. --- Switch symbols & TF=true – show the buttons to switch available symbols and timeframes. Button in horizontal row=19 - How many pairs in a row as button. Transparent buttons?=False - Make button transparent.